The Black Rock Coalition proudly presents The Million Man Mosh: A Benefit For Donovan Drayton. 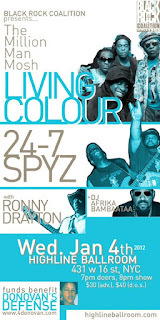 The show will feature two of New York City's most beloved bands gracing the same stage for the first time: the Grammy-Award winning group Living Colour and heavy metal soul pioneers 24-7 Spyz. Hip-hop founding father Afrika Bambaataa will do a DJ set, and there will a late jam with special guests including legendary guitarist Ronny Drayton. There will also be information on rare memorabilia that will be up for auction. Proceeds for the event will go to the legal defense of Donovan Drayton, son of Ronny, who has been incarcerated at Riker’s Island for four years without a conviction. As the flagship band of the Black Rock Coalition, Living Colour fused free jazz, funk, hard rock, and heavy metal into a sound that is uniquely its own. The band's debut album Vivid was released in 1988 and contained the hit single "Cult of Personality," which won a Grammy for Best Hard Rock Performance. The band's followup Time's Up (1990), garnered more critical acclaim and another Grammy Award. After an extended hiatus in the late '90s, Living Colour reformed in 2000 and released Collideoscope in 2003. Having recently released the critically acclaimed album The Chair In The Doorway (2009), the band is currently preparing material for a new album and tour in 2012. South Bronx natives Jimi Hazel (guitar) and Rick Skatore (bass) formed 24-7 Spyz ("twenty-four-seven spies") in 1986 and developed an immediate following based on their musical versatility. The group mixes soul, funk, reggae, and R&B with heavy metal and punk - a mix that came to be labeled as heavy metal soul. 24-7 Spyz broke up in 1998 after releasing several albums, including Harder than You (1988), Gumbo Millennium (1990), and the cult classic Strength in Numbers (1992). Reforming in 2003, the group dropped Face the Day (2006), its latest release and first album of original material in over a decade. 2011 saw a reunion of the Strength in Numbers lineup at a show in New York City, and that lineup will tour Europe in the first quarter of 2012. The band is now writing songs for a new disc that will be released in 2012. Guitarist Ronny Drayton, who has been a sideman for a virtual who’s-who list of New York’s brightest music stars (Roy Ayers, Melba Moore, James “Blood” Ulmer, Nona Hendryx, Defunkt, Edwin Birdsong, Kashif, The Family Stand, and more), will close out the night jamming with both bands and special invited guests.